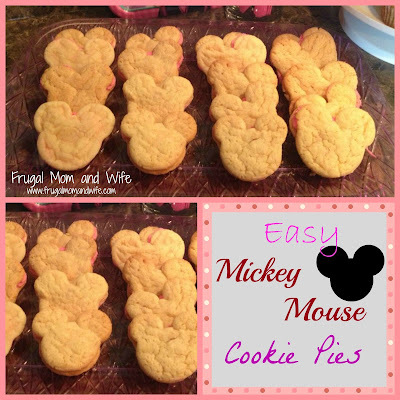 Frugal Mom and Wife: Easy Mickey Mouse Cookie Pies! Easy Mickey Mouse Cookie Pies! My daughter absolutely LOVES Mickey Mouse! For her 4th birthday, I made these awesomely delicious cookie pies for her. It's super easy and doesn't take that long to make. 1 - Can of Vanilla PINK colored icing. 1 - Cup of flour. *Mix all your ingredients specified on the sugar cookie package. to make it a non-stick cut for your cookie cutter. *Place each cut out on your baking pan leaving 1.5" to 2" in space between. *Lay cookies to cool once out of the oven. of one cookie. Then place another cookie on top. VIOLA!! Mickey Mouse Cookie Pies! 1 Package makes about 20 cookie pies!